Robert Byrne is the author of seven novels, five collections of humorous quotations, seven books on billiards, two anthologies, and an expose of frauds in the literary world. One of his novels, Thrill, was made into NBC’s Monday Night Movie, which aired for the first time on May 20, 1996. Four of his novels were selections of Reader’s Digest Condensed Books and published in many languages. His style is widely praised for its clarity and wit. Byrne’s Standard Book of Pool and Billiards, published in 1978 and expanded in 1998, has sold over 500,000 copies. 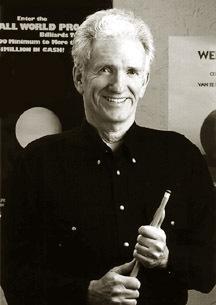 In the world of pool and billiards, his books, hundreds of instructional magazine articles, six videotapes (shot on sound stages in Burbank and Hollywood, California), have established him as the preeminent teacher and commentator. As a player, he has won tournaments in almost every form of the game. He finished third in the National Professional Three-Cushion Championship in 1977 held in North Hollywood. In 1999, he won both the National Amateur and the National Senior billiard tournaments. His contributions to billiards and pool were recognized when he was awarded the greatest honor in the sport: induction into the Billiard Congress of America’s Hall of Fame. The honor, for Meritorious Service, was bestowed on July 21, 2001, at the Las Vegas Hilton at a banquet closing the annual world billiard trade show. He was inducted with many-times world billiard champion Raymond Ceulemans of Belgium. Byrne was born and raised in Dubuque, Iowa, spent forty years in the San Francisco Bay Area, and returned to Dubuque in 1996, where he now lives with his wife Cindy, a painter and graphic artist. After graduating with a civil engineering degree from the University of Colorado in 1954, he edited a trade journal in the heavy construction industry. He became a full-time writer in 1977. In 1994 on Hilton Head Island, South Carolina, he received the Industry Service Award from the Billiard and Bowling Institute of America, an honor previously bestowed on Willie Mosconi, Paul Newman, and Jackie Gleason. "In my forty years in the game, I've never met anyone with Bob Byrne's contacts with top players around the world, his knowledge of the technique and history of the game, and his writing ability. His books are crammed with inside secrets and curious lore." For more, see the Robert Byrne (author) Wikipedia article. Copyright © 2014 Robert Byrne. All rights reserved. Please direct questions and comments about this site to webmaster@byrne.org. Contact Mr. Byrne at bob@byrne.org.